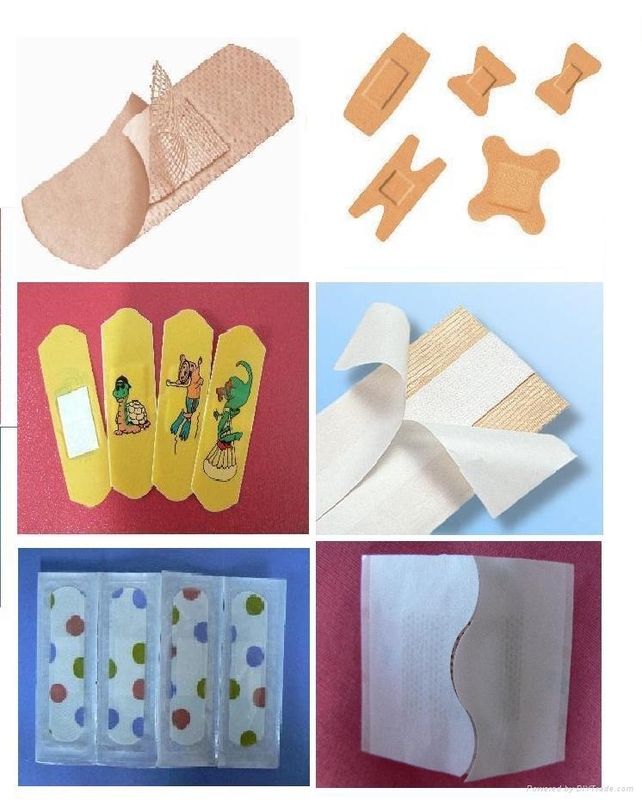 Specializing in First Aid Adhesive plasters, Medicated Plasters, Surgical Absorbent Dressing, and Wound Care product production machinery, CHANGZHOU JIANZHI has embraced the medical industry by designing and efficiency at heart. We have the current production list of 8 different machines, during the initial period of establishment in 2004. Urged by the progress pace of technology, most of the products on the market are unavoidably replaced by the newer and more advanced ones to meet the requirements of modern life, among which the machinery and products for medical use are regarded as the most. 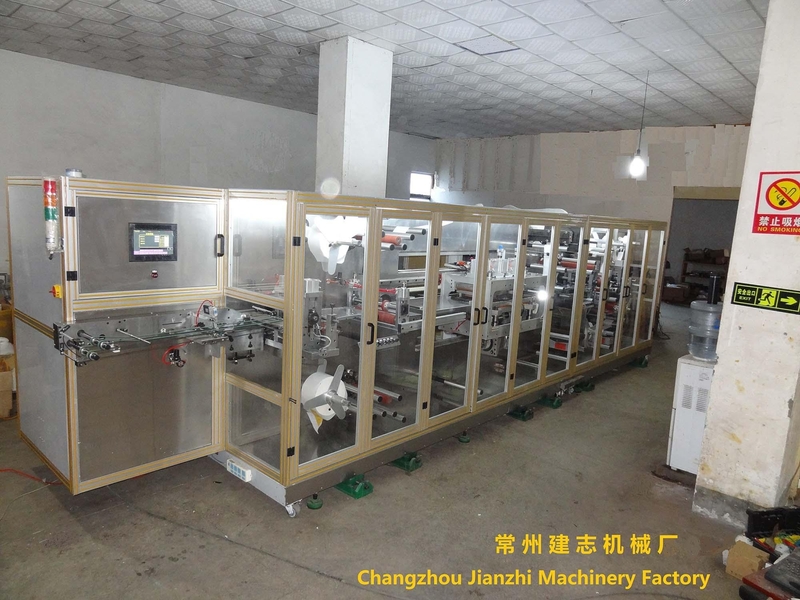 As a result, after hard working on the above for more than four years, we have succeeded to renovated whole plant equipment for making the First-aid Adhesive Plaster machine, wound pad cutting & packing machine , Zinc Oxide Plaster machine. It is worthy of pointing out that all of our medical machines are easy to operate for high quality production with low labor requirements due to our unique technical designs with highly efficient system working ability in this regard. Because of lower price, our machines are mostly sold to several big famous companies and several small companies in China Mainland. Because of our excellent quality , after-sale service and lower prices, our buyers are deeply impressed with our supplies which enables us to enjoy a lasting ovation home. And now, we want to exported to aboard for worldwide. we are looking forward to serving you. 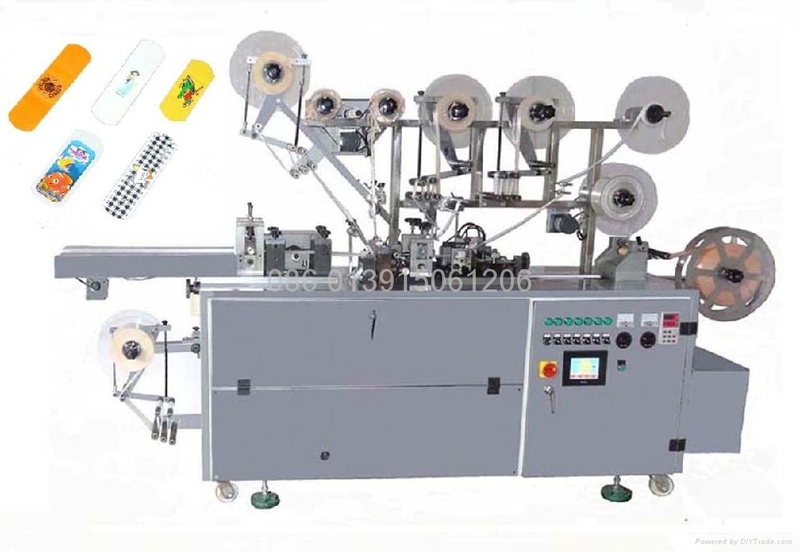 DC306N First Aid Adhesive bandage packing machine is a new automatic making adhesive bandage machine that it only needs 1 person to operate and need 1-2 person to put the finished bandages into boxes. It can make 2 types of absorbent pad: full core or island core. It can produce with many kinds of adhesive substrates. The sizes of adhesive first aid bandages: wide: 10 -25mm . Produce speed: 360pcs/min(full absorbent pad core);320pcs/min(island absorbent pad core). The inverter speed regulation system on this machine makes it much easier to shift speed. 2) For this DC-306N, during production the machine will automatically stop as soon as the material run out. 3) To reduce adhesive tape deformation, the release paper is designed to come out with the adhesive tape. 4) Clutch rewinding for waste rewinding after will help waste proceeding more smoothly on the paper tube of 80 mm in width. Even the most breakable material can easily be processed for waste rewinding. 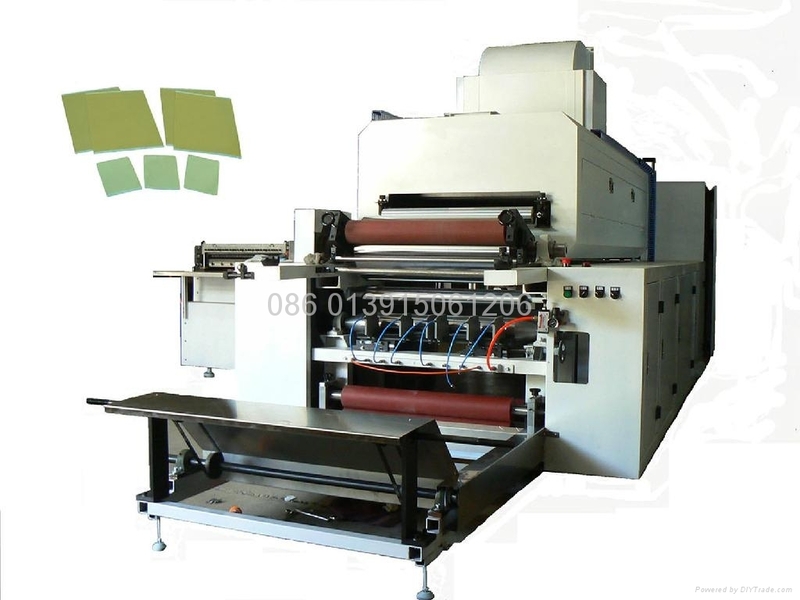 5) For this DC-306N, it is not necessary to stop the machine while correctly adjusting the related positions of dressing pad, perforating and packing paper sealing/cutting. 6) The feeding direction of dressing pad changed to straight forward will never cause its distribution off to one side when placing it on the adhesive tape. 7) The selected teeth-type belt transmission used for this machine to reduce the noise produced form the driving. 2) Frequency conversion & stepless adjustable for complete machine set,equipped with counter for auto machine stall. 3) Pneumatic clutch control of rewinding tension with pressure display. 4) Include the cutting machine, PLC servo motor contral. 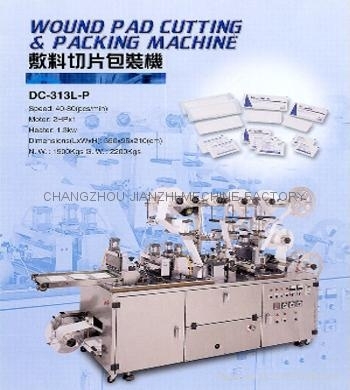 This DC313LP automatic packing machine is used to make medical wound pad. To compound material, cutting and packing. 1）The inverter speed regulation system on this machine makes it much easier to shift speed. 2）For this during production the machine will automatically stop as soon as the material run out. 4) Clutch rewinding for waste rewinding after will help waste proceeding more smoothly on the paper tube of 80mm in width. Even the most breakable material can easily be processed for waste rewinding. 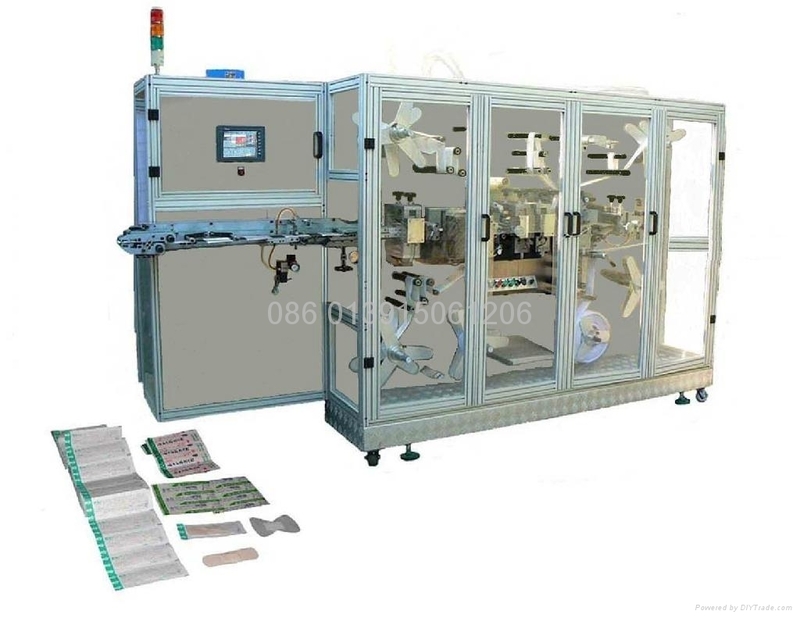 5) For this , it is not necessary to stop the machine while correctly adjusting the related positions of dressing pad, packing paper sealing/cutting. 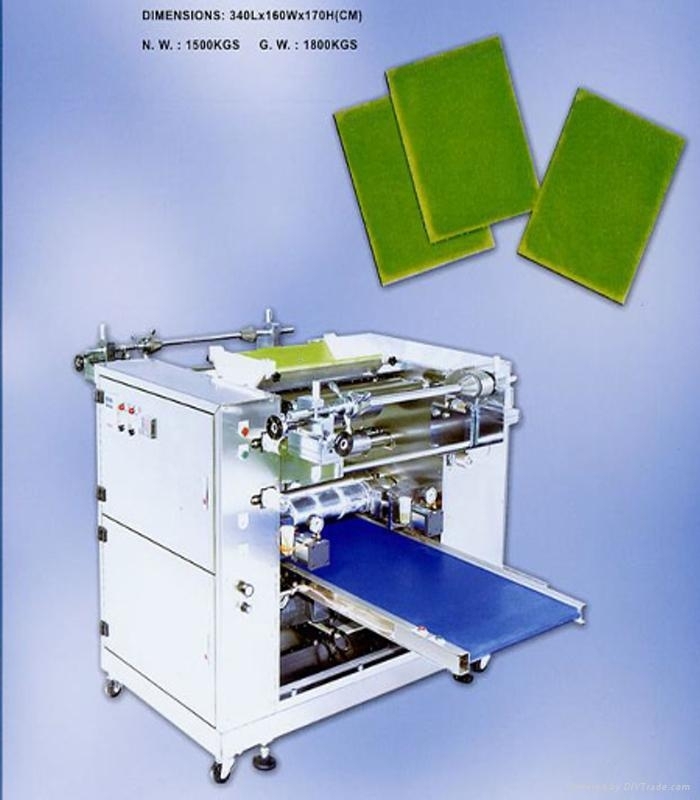 6) Packaging paper is pulled forward .by the photoelectricity switch on-line scoutting, with precise feeding size .Easy size-setting is better than conventional adjusting methods. 7) Required sealing temperatures and time can be set according to different materials for achieving the best sealing effect. 8) The selected teeth-type belt transmission used for this machine to reduce the noise produced form the driving. 9) The stainless steel top face on the machine not only makes a nice appearance ,but also provides an easy way for cleaning.